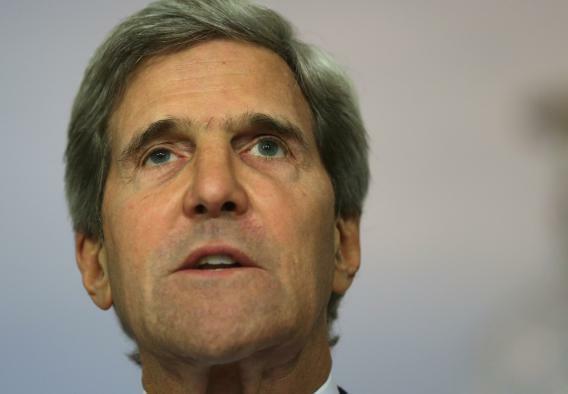 John Kerry's Senate Foreign Relations Committee testimony. U.S. Secretary of State John Kerry makes a statement at the State Department August 30, 2013 in Washington, DC. SEN. MENENDEZ: Mr. Secretary, we received from the administration a proposed resolution for the authorization of force, and of course that is a negotiation between the Congress and the administration. Would you tell us whether you believe that a prohibition for having American boots on the ground – is that something that the administration would accept as part of a resolution? SEC. KERRY: Mr. Chairman, it would be preferable not to, not because there is any intention or any plan or any desire whatsoever to have boots on the ground. And I think the president will give you every assurance in the world, as am I, as has the secretary of defense and the chairman. But in the event Syria imploded, for instance, or in the event there was a threat of a chemical weapons cache falling into the hands of al-Nusra or someone else and it was clearly in the interest of our allies and all of us, the British, the French and others, to prevent those weapons of mass destruction falling into the hands of the worst elements, I don’t want to take off the table an option that might or might not be available to a president of the United States to secure our country. The Syrian regime’s use of chemical weapons poses grave risks to our friends and partners along Syria’s borders including Israel, Jordan, Turkey, Lebanon and Iraq. If Assad is prepared to use chemical weapons against his own people, we have to be concerned that terrorist groups like Hezbollah, which has forces in Syria supporting the Assad regime, could acquire them. This risk of chemical weapons proliferation poses a direct threat to our friends and partners, and to U.S. personnel in the region. We cannot afford for Hezbollah or any terrorist group determined to strike the United States to have incentives to acquire or use chemical weapons. Kerry surely understands all this, which is why he was so quick to correct himself with the “boots on the ground” question. And meanwhile, Bashar al-Assad’s official Instagram account posted a recent Assad quote on how he’s defending the interests of the Syrian people.